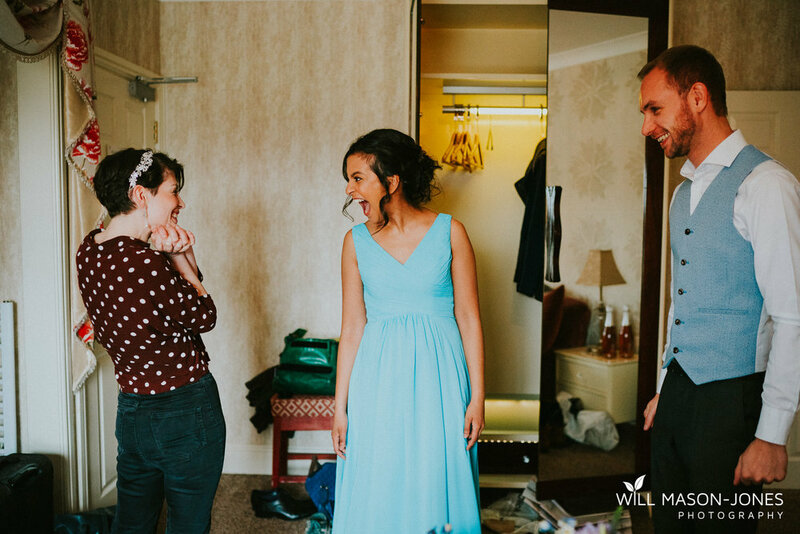 A colourful and uplifting wedding full of genuine belly laughs, and incredible home-made details! 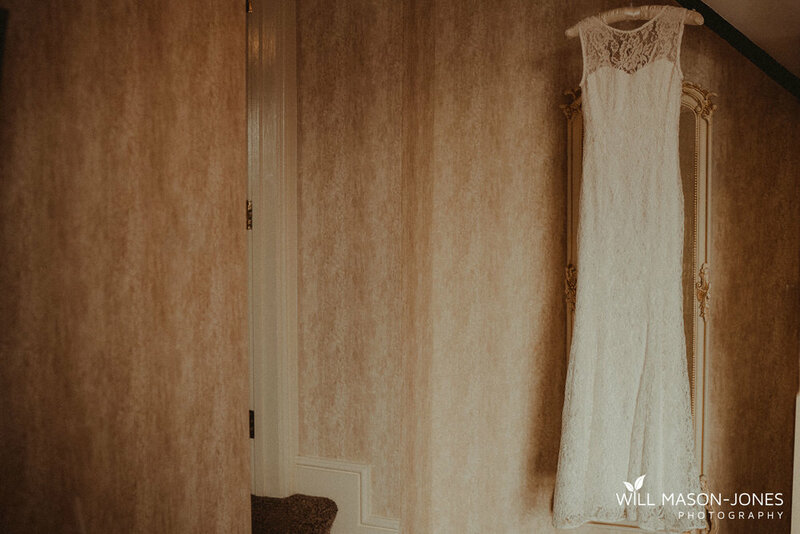 Vikki & Mike both started their morning getting ready with their close friends at Llanerch Vineyard itself, allowing me to document both sides of preparations! There was plenty of pastries, shirt-ironing, broach choices and, above all else, laughter. In fact, this was a sign of what was to come, have you ever seen so many genuine outbursts of laughter throughout the day!? 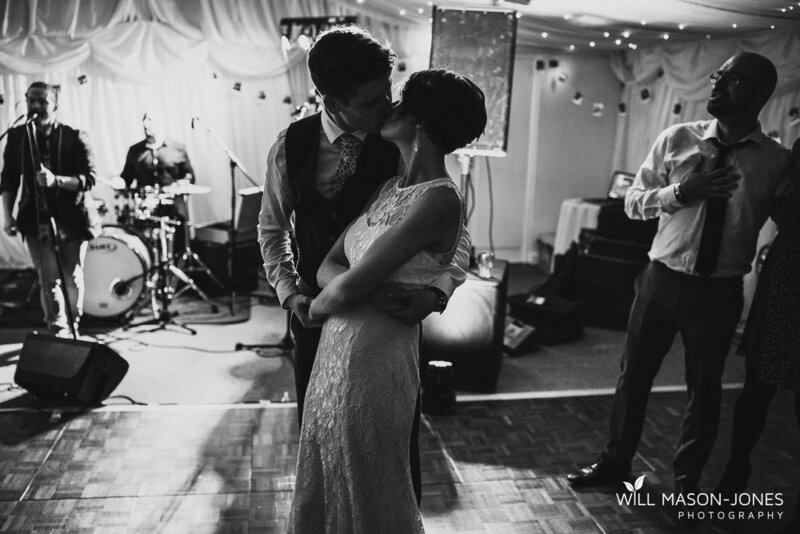 Not only from Vikki & Mike but from their friends and family too, it was absolutely infectious! 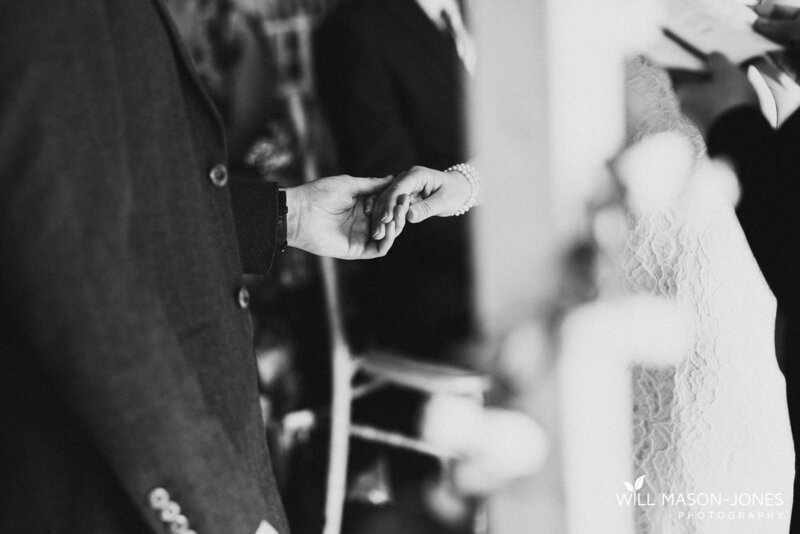 Bridal and groom preparations at Llanerch Vineyard were super relaxed and fun, gearing everyone up for the celebrations to come. It was also a great chance to have a catchup about handmade wooden arches and homemade jams, home-grown flowers and hand-collected pebbles, but more of that soon. The ceremony itself took place bathed in a wonderful light, underneath a fantastic wooden arch which Vikki & Mike made themselves, assembled in the rain when at the venue, and which they plan to keep in their garden! On the subject of the garden, all the flower centrepieces and other flowers decorating the ceremony room and marquee were grown by Vikki & Mike, can we just stop to appreciate that incredible unique touch which is by no means an easy feat to coordinate, let alone having such a wonderful variation! Blooming lovely. 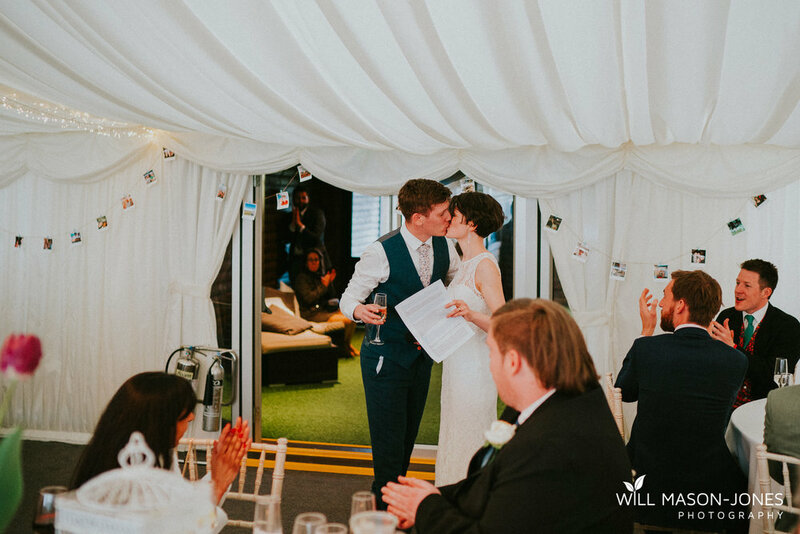 There was plenty of happy tears and more belly laughs throughout the wedding ceremony at Llanerch Vineyard as you can see below, made even more special by having a dear friend of Vikki’s conducting the ceremony, and by the couple reading their own choice of vows! Following the ceremony, one of the longest and most incredible confetti welcome lines was created. 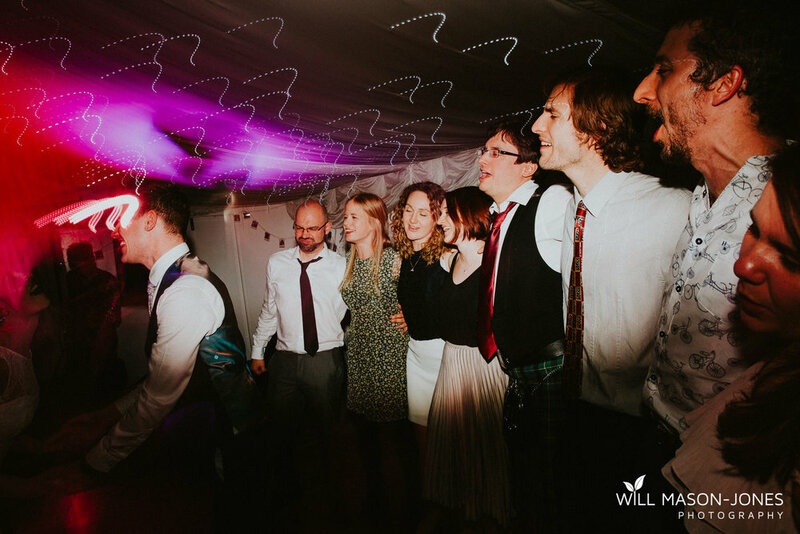 It seemed to go on forever, and there was enough confetti for every guest to have a good fist-full, resulting in shower of colour and of course lots of smiles! After this, everyone had a chance for some drinks and canapés next to the vineyard itself, as the day brightened up even more! Lawn games went down a treat with everyone, particularly a very competitive game of bananagrams, also home-made with individually spray-painted letters! Fully committed Jenga competitions also took place which got super intense! Coming away from the fun and excitement for a few peaceful moments together, I joined Vikki & Mike along the woodland walk at Llanerch Vineyard for some natural and fun couple wedding portraits. We had a great chance to slow things down and get some wonderfully earthy, colourful wedding portraits in the sunny woodlands! 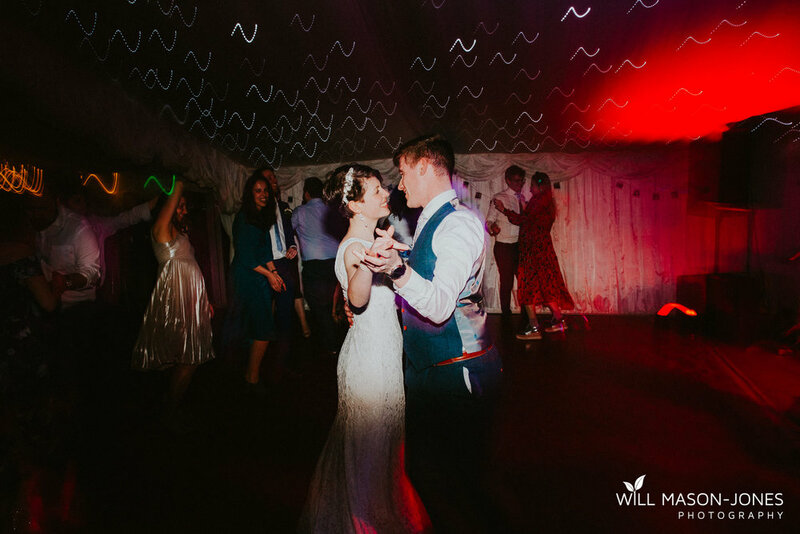 The reception in the marquee at Llanerch Vineyard was bright and uplifting, full of colourful flowers and an AWESOME stack of cheese instead of a cake! Emotional speeches followed a LOT of wonderful, hearty food including pie and mash! Vikki & Mike did a joint speech which I thought was just incredible, and something I’d love to see happen more often! As the room was being cleared and the band was tuning up for the evening, there were small groups of people forming near the dancefloor, dancing to the background music, which was such a brilliant sign that everyone couldn’t wait for a dance, and bloody hell did they exceed my expectations! 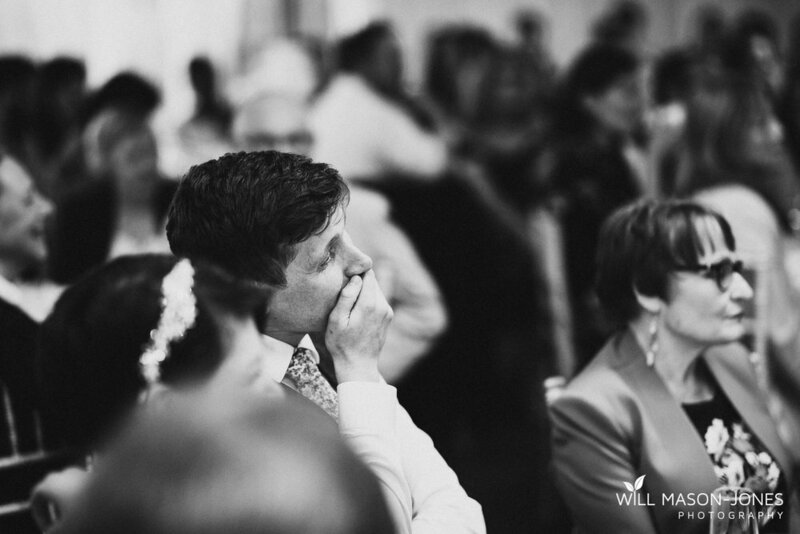 Shortly after the curtain raised for Vikki & Mike’s first dance, guests swarmed the dance floor, and I can honestly day they did not leave until the band was done, Vikki & Mike included. Some serious dance commitment was evident, with everyone purely enjoying the music together, I couldn’t resist a bit of a dance myself! 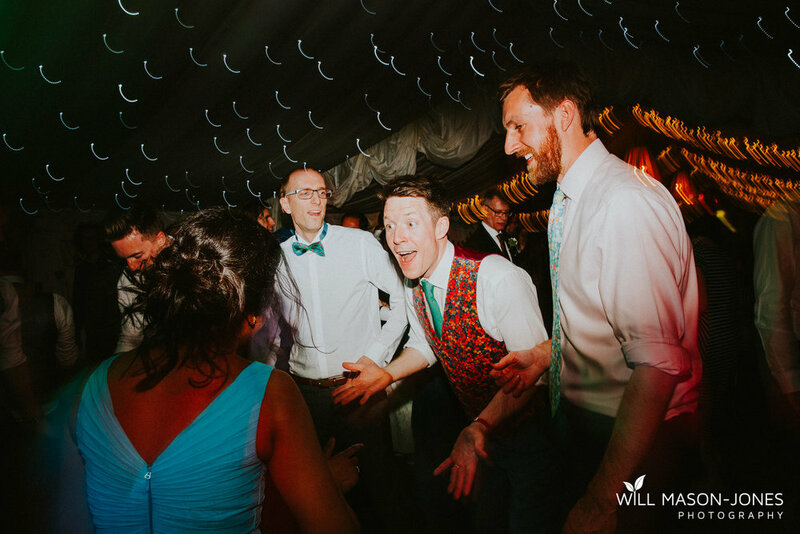 I captured some of my favourite EVER colourful and energetic wedding dancefloor photographs! 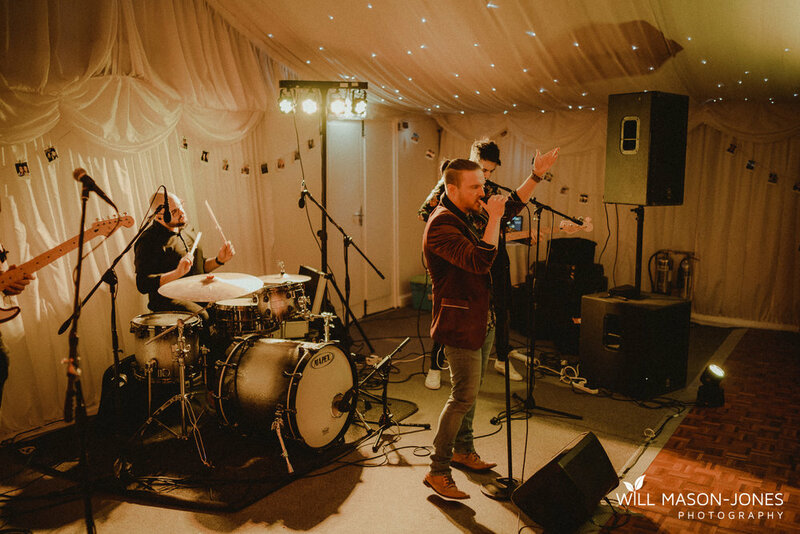 I’d like to say another huge thank you to Vikki & Mike for letting me be their Llanerch Vineyard wedding photographer, I hope you enjoy some more highlights below! llanerch vineyard wedding photographer, cardiff wedding photographers, south wales wedding, alternative wedding photographer, relaxed wedding photography, wild weddings, vineyards in the UK.